Your MacBook lets you create your own special Home Folder. Each user account that you create in Mountain Lion is actually a self-contained universe. 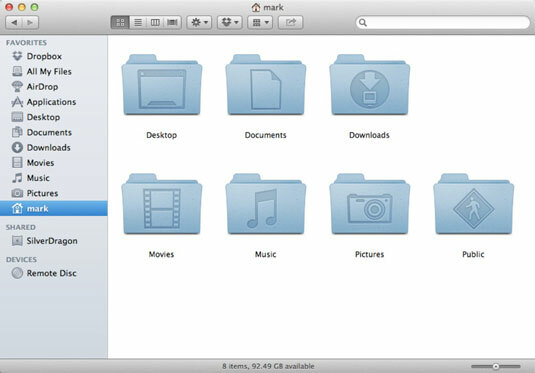 For example, each user has a number of unique characteristics and folders devoted just to that person, and Mountain Lion keeps track of everything that user changes or creates. This unique universe includes a different system of folders for each user account on your system. The top-level folder uses the short name that Mountain Lion assigns when that user account is created; don’t necessarily look for a folder named Home. Naturally, the actual folder name is different for each person, and Mac techno-types typically refer to this folder as your Home folder. Create subfolders within your Documents folder to organize your files and folders even further. From the Go menu: Choose Go→Home to display your Home folder immediately from the Finder window. Alternatively, you can press cmd+Shift+H to accomplish the same thing. From the Open dialog: Mountain Lion’s standard File Open dialog also includes the same Home folder (and subfolder) icons as the Finder window sidebar. 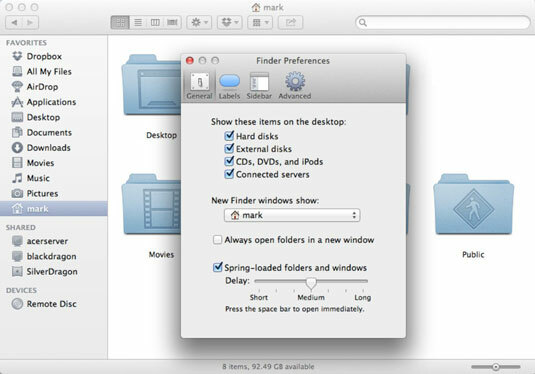 Choose Finder→Preferences and click the General tab to display the dialog. Click the arrow button at the right side of the New Finder Windows Show pop-up menu. A menu pops up (hence, the name). Click the Home entry in the menu. Click the Close button at the upper-left corner of the dialog. You’re set to go. From now on, every Finder window you open displays your Home folder as the starting location! Here’s another reason to use your Home folder to store your stuff: default locations! Mountain Lion expects your stuff to be there when you migrate your files from an older Mac to a new Mac, and all iLife and iWork applications look to your Home folder when loading and saving projects.